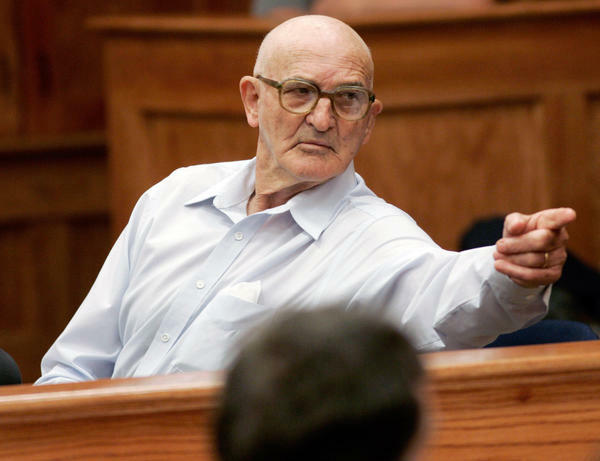 Convicted killer Edgar Ray Killen points to a family member during a recess in an appeal hearing for his bond in Philadelphia, Mississippi, September 9, 2005. Edgar Ray Killen, the former Ku Klux Klansman responsible for a notorious civil rights era murder, has died in a Mississippi prison. Killen orchestrated the killings of three Freedom Summer workers in Neshoba County, Miss. in 1964, a crime that shocked the nation and acted as a catalyst for passage of the Civil Rights Act of 1964. The state corrections department says Killen died at 9 p.m. Thursday night at the Mississippi State Penitentiary. He was 92 years old and was serving a 60-year sentence for manslaughter in the killings of civil rights workers James Chaney, Andrew Goodman and Michael Schwerner. The three civil rights workers, all in their 20s, were ambushed on June 21, 1964. They'd been lured to the area to investigate a church burning outside Philadelphia, Miss., and as they were leaving, local authorities arrested them. Hours later, they were released from jail, chased down by carloads of Klansmen, and shot to death. Their bodies were discovered 44 days later, buried in an earthen dam. The dramatic search for the missing men drew national attention to the violent resistance to the civil rights movement. Killen, a part-time Baptist preacher and KKK kleagle (organizer), faced federal charges in 1967, but the trial ended in a hung jury after a hold-out juror said she couldn't convict a preacher. The state of Mississippi didn't press charges at the time. Nearly four decades later, state prosecutors re-opened the case, which had been dramatized in the 1988 movie Mississippi Burning. Killen was the only person charged, even though other suspects were still living. According to testimony in Killen's 2005 murder trial, he plotted the murders — right down to arranging for the bulldozer to bury the bodies — and later bragged how the civil rights workers had "been taken care of." At the time, Neshoba County District Attorney Mark Duncan told the jury their decision carried historical significance. "For 41 years it's been Edgar Ray Killen and his friends who have written the history of Neshoba County," he said during closing arguments. "What you do today when you go into that jury room is going to echo through the history of Neshoba County from now on." The jury convicted Killen of manslaughter, which some of the victims' families found insufficient. Mickey Schwerner's widow, Rita Schwerner Bender, has said it's too late to achieve justice. She has long called for the acknowledgement of the state's role in encouraging racist violence. The Mississippi Department of Corrections says Killen's cause of death is pending an autopsy, but that he was suffering from congestive heart failure and hypertension. "No foul play is suspected," according to a statement.